mister kabab | I am Complicated. 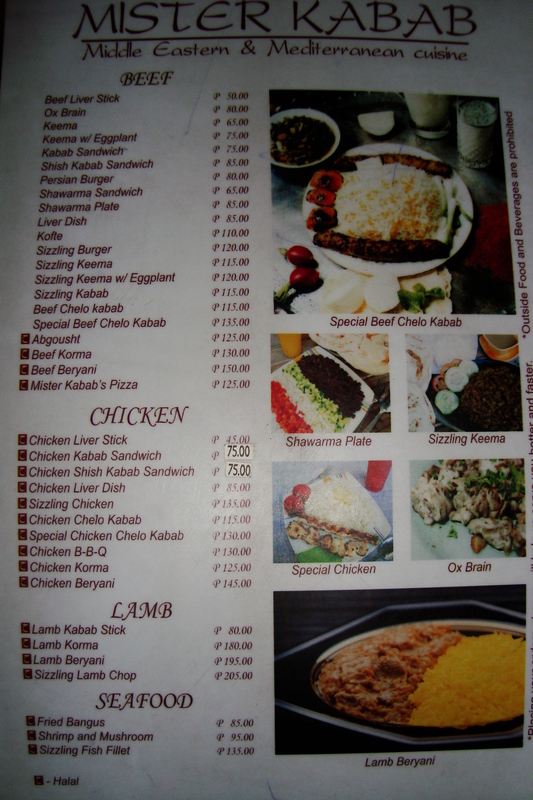 For the second leg of J’s birthday eatfest, we went to Mister Kabab straight from Chicken Charlie. I’ve been hearing a lot about this place since a long time ago, how great the food was, but it’s only now that I got the chance to try it. We arrived there around 3:00 in the afternoon. The place has a spacious dining area with wooden tables and chairs. It had open walls, and is ventilated by ceiling fans. It was an overcast day, so it was rather dark. The place was poorly lit. Anyway, we went ahead and got a table near the water station (House water is self service. You have to go to the water station to get your glass, fill it, and bring it to your table.). I was happy to see their menu. I thought to myself, “Ang mura naman dito!” ’cause usually, from the others I’ve tried, Kababs sell for like Php 190 to more than Php 200. We ordered the Special Chelo Beef Kabab, which is a staple order in these places. It’s special because it had two pieces of beef (that’s according to our server). We asked that the rice be changed to Pita bread because we just had rice at Chicken Charlie. The bread was huge, well bigger than what I normally get from these places. It had a grilled whole tomato, but no onions. The beef was tender and tasty, especially if you spread the butter over them. 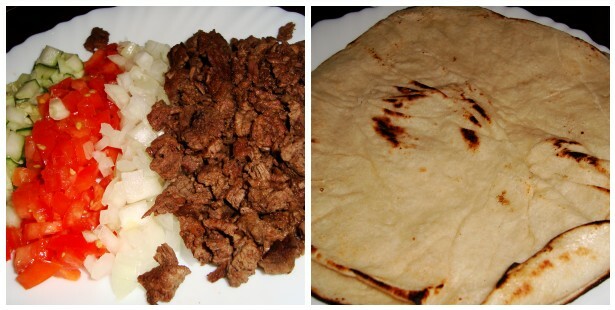 We also got the Shawarma plate, where in the vegetable toppings and beef are served separately, on a plate. You have to make your own sandwich. 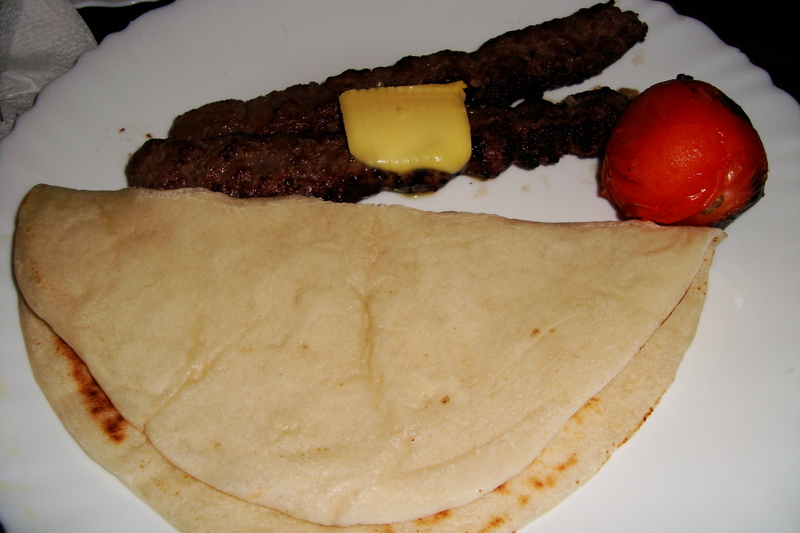 We then got the Kabab Sandwich too and realized after a while that it’s just like the Chelo Beef Kebab, only that it is already wrapped in the bread. Haha. It’s still all good though. Sadly, I didn’t get to take a picture of it. It costs Php 75 as you can see from the menu above. Their sauce is a little bland for my taste. Not that it’s terrible. It was okay. But I like Persia Grill’s better. They said it’s best to eat here at dawn, after night long gimmicks. Perhaps they have better lighting then? Or maybe because the feel of the place changes once there are a lot of people inside? Or maybe the food tastes better when you’re intoxicated? I have yet to experience the early dawn vibe. But so far, I have been satisfied. I’d go back if I get the chance.